The 19th century idea of a varied diet was one with different sorts of meat in it. Milk and vegetables were regarded as not only inedible raw, but highly dangerous until boiled thoroughly. To a certain extent this is understandable there was no refrigeration of fresh produce and diseases such as cholera and typhoid were widespread so cooking all food and drinking powdered milk was probably very sensible. 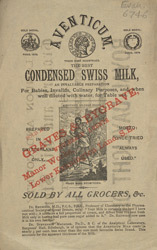 This leaflet also emphasises how useful condensed milk was as a nutrition provider for children and the sick and infirm.